Yay! You’re engaged! Now it’s time to get into planning mode and make your big day unforgettable. You’ve probably been thinking for months (or years!) about all the pretty stuff you want for your wedding, and now that it’s official, it’s time to get into the details. 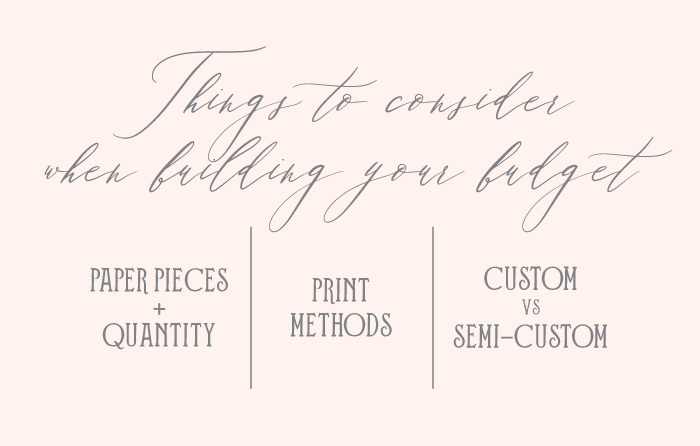 With that in mind, take a look at our comprehensive guide to building your stationery budget. Which specific paper pieces do you need? What’s the quantity you’re looking for? What’s your preferred printing method? 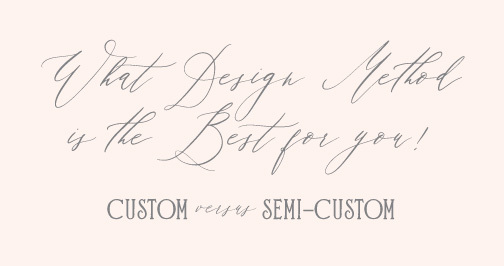 Do you want to personalize an existing design, or do you want a bespoke design created specifically for you? 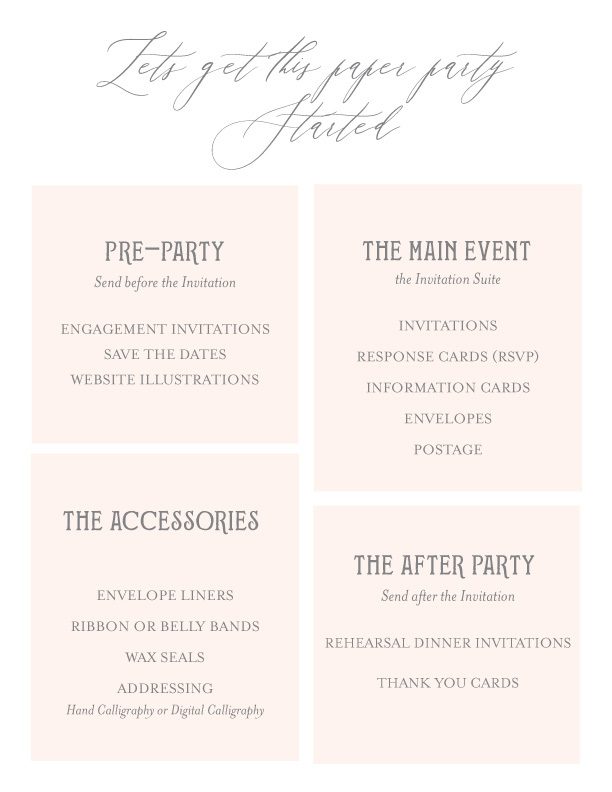 Do you want to accessorize your invitation suite? As we mentioned above, your printing method is another important element to consider when building your invitation budget. 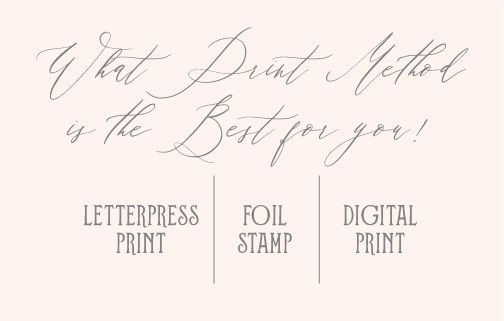 We offer three of the most popular print methods: letterpress, foil stamping, and digital print. What began with hand-set wood and metal type has given way to polymer plates that allow complex modern fonts and designs to be suitable for letterpress printing. Once the plates are made, the printing is done in our antique printing press, fed by hand one piece at a time and one color at a time. This results in a beautiful, deep impression that created the ultimate textural experience. Letterpress printing looks great on thicker cardstocks and almost always utilizes 100% cotton paper stock (cotton gives the best impression and holds the ink nicely). Due to the translucent nature of the inks, letterpress does have limitations with very dark cardstocks. Foil stamping is somewhat similar to letterpress in that the color is applied to paper with pressure. However, instead of the polymer plates used above, metal dies are created. The dies are heated and then stamped with enough pressure to seal a thin layer of foil to the paper. Foil can be used to create a variety of finishes (i.e. metallic foils have a shiny, lustrous finish with a big visual impact). Since foil stamping is opaque, the foil color does not change based on the color of paper on which it is printed. This makes metallic or lighter-colored foils an excellent choice for darker-colored papers. Digitally printed invitations are printed directly from a digital file on a computer. Digital printers transfer four colors of ink (cyan, magenta, yellow, and black) to the paper simultaneously, producing a full-color image after only one pass through the printer – meaning that each invitation takes less time to produce. Unlike letterpress, which leaves a relief impression, digital printing produces a flat image without any texture. Digital printing does have limits. Papers must be able to withstand heat and travel through an often curved path in the printer, which means that the variety of paper stock that can be used with this method is more limited than for letterpress and foil. All of these print methods can be interwoven to create the perfect suite. Depending on the look and overall feel you are going for, we can advise you on what will look the best with your invitation suite. 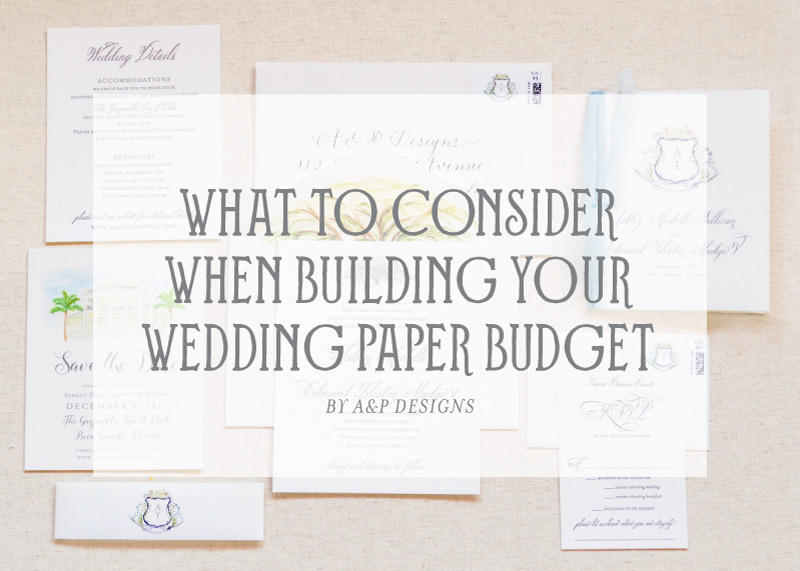 The final thing to consider when building your paper budget is the design. You can personalize a pre-existing template from our Design Bar Collection, or you can choose to go with a bespoke design created just for you. You can read more about both of our amazing options here!